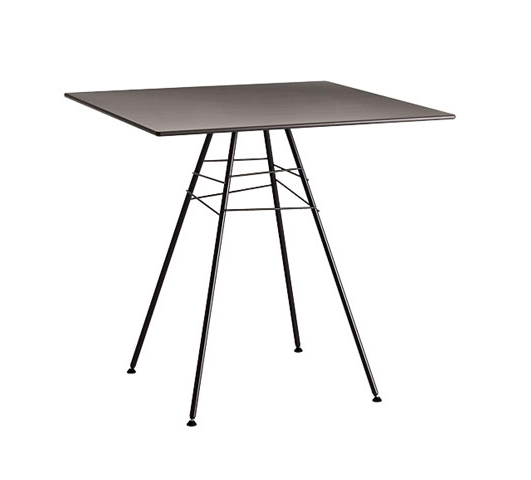 Table with four leg steel base and square top made of HPL. Painted base available in white, moka and green, while top is only available in dark grey. Suitable for outdoor use. Height 74 cm – 29 1/8″ (art. 1815). Table top size: 79 x 79 cm. Subtle allusions that capture the pleasing irregularity of nature create comfortable and iconic surfaces and silhouettes. The observation of nature is revealed in the shape of the table tops — similar to the shape of a pebble polished by the water — and in the particularity of the structures of chairs and tables, displaying an irregular design reminding of the branches of a tree or a leaf veins. Leaf is a manifesto: an image simultaneously nostalgic and forward thinking. Its simplicity of form and ease of application encourage creative inclusion in diverse environments, both inside and outside. Chair, stackable chair, lounge, chaise longue and tables. Chairs are fabricated in chrome-coated or matte powder-coated steel in white, green or moka. A detachable polyurethane cushion is available for indoor and outdoor use. Perfect for relaxing at work or at home, the Leaf table fulfills the needs of those who favor an essential design and a light presence in the space and is the ideal companion to the Leaf chair. Tables are available in two heights (50 and 74 cm – 19 5/8” and 29 1/8”) in three top surfaces: round (diameter 79 and 100 cm – 31 1/8” and 39 3/8”), square (79 x 79 cm – 31 1/8” x 31 1/8”) or triangular with rounded edges. Bases are available with 3- or 4-legs. All are fabricated in white, moka or green painted steel. A water-repellent HPL top is available in the gray only for all base options. All Leaf chairs are GreenGuard certified.